Hello and Welcome to GetWebInfo. Here on this post you can learn about that How to To Create Social Content Locker In Blogger BlogSpot. How many people are using social networking websites to boost their website's Traffic? There are tons of professional Bloggers who entirely depends on the Social Traffic. However, it is extremely difficult to get social exposure quickly. Though there are some widgets which help increase social followers but not enough. Do you use multiple social sharing widgets on each and every page of your site? However still your social exposure is on the lower side. Actually the problem is that people lover your content. How to Install Content Locker Is Blogger? The Steps are extremely straightforward that even a small kid can follow it. There is no need of learning any HTML coding because all we have to do is to copy paste the coding. Now you can just follow these steps to install social widget locker in blogger. 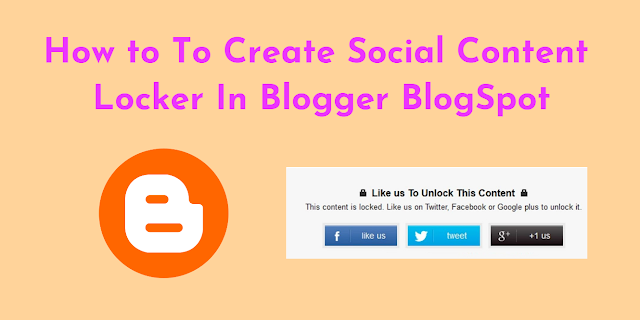 Now where you want to add a social content locker in his specific article then you can follow these steps to add Social Content Locker in Blogger Blog. I Hope this article is really helpful for you and if you have any problem about this article so please content us we can solve your problem as soon as possible.